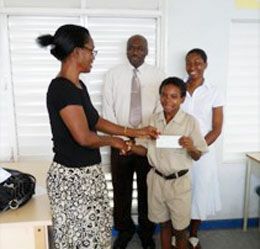 Dabriel wins a scholarship from SVG Association of Massachusetts Inc.
Dabriel will receive a yearly disbursement for his education for up to seven years, provided he lives up to the requirements and expectations of his sponsor. The SVG Association of Massachusetts, currently headed by President Junior Hewitt and Vice-President Amelia Edwards, has maintained a scholarship programme for Vincentian students in Massachusetts for several years. The group began extending assistance to students in St. Vincent and the Grenadines from 2009. Dabriel is the third student to benefit from the organisation. The other current recipients are Vandyke Clarke of the Troumaca Secondary School (2009) and Mariah Alves of the Bequia SDA Secondary School (2010).